Poll: Do you support the Sawmill? I recently had an idea for a new block while trying to think of ways to manipulate wood in Minecraft. The block is named the sawmill, and looks like this. The sawmill can receive redstone power from the bottom or any of the four sides. When powered, the blade on top would begin spinning, and a distinguishable whirring noise will come from it until it is cut off from the power source. While it's in it's powered state, mobs and players that stand on top of it would take 2 hitpoints of damage per second (twice that of a cactus), making it effective in a trap. Its primary use, however, is naturally the cutting of wood. When a log block of any type is present in the space above the sawmill (while it's in its powered state), the block would break after three seconds and six planks of the log's type would fall around the sawmill, thus making it an effective alternative to crafting logs into planks... assuming one is present. Nothing happens when other blocks are placed on top of it, except for wooden planks, which break into two wooden half-slabs, and sand/gravel, both of which break over the sawmill and drop as an item. This is the crafting recipe for the Sawmill and Sawmill blade, the latter of which is required to craft the former. 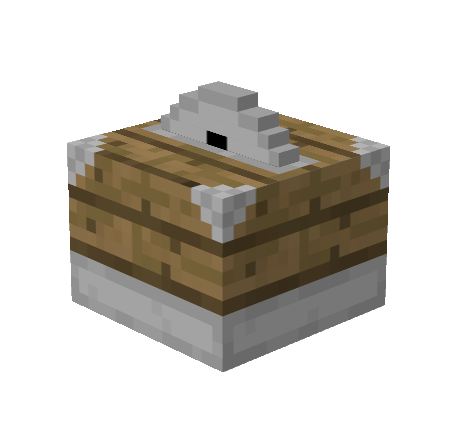 (The oak planks in both recipes can be any type) (The iron block in the Sawmill recipe represents the Sawmill blade) The intended use of this is to have one available in your home sometime mid-tier. If you were crafting logs at home, you would use this so that you might get more wood. However, if you were in the wilderness, or mining, the crafting grid is a much more convenient option. It could also be used to automate tree farms, I imagine, although I'm no expert on factorization in Minecraft. So, it's a good tool for the average survival player, a useful block for the experienced tree farmer, and a brutal executioner for the resourceful trapper. I've spent a few hours thinking about this, and I've tried to make this as balanced and fitting as possible. Suggestions, criticism and friendly discussion is welcome and encouraged, and of course, thank you for reading. Want better ways to produce wood? Click on this link! I'd rather not add "tiers" to this block because I feel like it takes away from the vanilla feel of it. I imagine it looking something like the wooden block on the far left. I will change the crafting recipe soon. But thanks for the support! I can actually think of places this would be useful! Trapping players for loot is so hard, because both lava and cactus destroy items. Also, the chance of extra wood is pretty cool. I feel this is something that's a nice addition to Minecraft. First of all, wood is already renewable, so giving bonus planks per wood is a nice extra that doesn't unbalance the game at all. Secondly, there isn't a way to yield more planks from a single block of wood (as I know of). But there is for Coal, Lapis and even Diamonds. So why not? Lastly, a new tool for protecting my wealth is always welcome, hehe. Maybe the blade would take damage, and after a whole lot of blocks it breaks and you'll have to replace the blade or craft a new sawmill. Like the anvil. Thank you for the support! I thought about adding that as a feature, but I wasn't quite sure how to implement. I've come up with a concept, though, and I'll be implementing it today. You can tell me whether or not you like it. Full support but needs to be more expensive. Also I think that you could place oak logs in it, maybe it would provide more planks than regular crafting? You are using more advanced way of producing it further, so logic says the income should be greater as well. Indeed. There is already a chance that you will have greater income, as stated in the OP. I didn't want to make it a 100% chance, though. I will also be making it more expensive today. To the rest of you, thank you all for your support and contributions! I like it. But I also agree about it being more expensive. Maybe replace the bottom 2 wood planks with 2 stone blocks? Aaaaaaannnd, you should really use fic18's design. Changes will be made to the crafting recipe soon. I private message'd him about using it, I think it's a fantastic design. UPDATE: I've updated the OP with a new crafting recipe, and art provided by fic18! I've also included a link to his Art Gallery suggestion, which is fully supported by me. I'm glad you think so. A poll has been added and the title has been updated as well. Great idea! Long as hoppers will be able to pick up the planks that land on top, I'll support! Also, perhaps it would require an iron block instead of a plank block, for the blade recipe. Thank you! Yes, the planks fall around the sawmill in a way that a circle of hoppers should be able to pick up everything that drops. I don't want to do that, because then I'd feel it would be too expensive and not worth the cost. Makes sense, but it almost seems "too useful", for it's cost. Instead of an iron block, perhaps have the blade cost four more iron? It wouldn't exactly fit the appearance of the blade, though, so I don't know. The Sawmill should also be able to work on stairs and slabs, which would divide them into blocks that would look like a half-slab. I didn't want to make this block overcomplicated or have too many uses, so I elected not to do that. I may work on another block in the future that makes new block shapes. This actually seems like a great idea! Would be a nice addition and an interesting thing to play around with. Support.Could be used for mob grinders.Or at the bottom of trenches. Perhaps putting a plank on top could make 2 slabs pop out or a stair, so that 1 plank=1 stair, instead of 1.5 planks=1 stair. It could be a way of creating more stairs than usual. the getting extra planks feels mod-like to me... minecraft has a certain constancy that's hard to define. Getting extra planks seems like it defies that to a small extent. Minecraft really does need a weaponized block though and one with an additional function that could be used for red-stone contraptions is cool. also the model helps sell it.